Spey casting is a casting technique used in fly fishing. Spey casting can be accomplished with either a normal length fly rod, or a rod referred to as a double-handed fly rod, often called a Spey rod. Spey rods can also be used for standard overhead casting. Spey casting is used for fishing large rivers for salmon and large trout such as steelhead and sea trout. Spey technique is also used in saltwater surf casting. All of these situations require the angler to cast larger flies long distances. The two-handed Spey technique allows more powerful casts and avoids obstacles on the shore by keeping most of the line in front of the angler. Spey casting originated in the heart of Scotland in the mid-1800s. The name comes from the River Spey in Scotland, which is where the cast originated, presumably at Gordon Castle Estate and Wester Elchies beat. Therefore, the Spey cast was developed so one could successfully cast on a large river such as the Spey. When Spey casting was introduced, 22-foot rods were used. These rods were made of greenheart, a heavy wood imported from British Guyana. Today, rods are only 12 to 15 feet in length, and can toss a line up to 80 feet. There are two groups of Spey casts, the "splash and go" and the "waterborne anchor". Splash and go casts contain a backstroke that is in the air. The line then falls to the water, and the forward cast starts as soon as the tip of the line touches the water. The waterborne anchor casts are different, as they contain a backcast that stays on the water. In these types of casts, there is no requirement to achieve perfect timing in order to forward cast after. While there are many variations of the Spey cast, the basic technique is broken down into a few simple actions. With the fly line floating directly downstream, the angler first lifts the line off the water with the tip of the rod. The angler then sweeps the line backwards just above the water, and allows just the fly and leader to "anchor" the cast by touching the water one to two rod lengths away. This back-cast is often referred to as the "D-loop", from the curving shape of the line between the anchor and the tip of the rod. While swinging the "D-loop," it is important to make one continuous, deliberate motion with the rod tip climbing at a 45-degree angle off the water. As the D-loop comes around, the cast is completed by firing the line forward with a sharp two-handed "push-pull" motion on the handle of the rod while making an abrupt stop with the rod tip at the end of the cast. The cast is most easily compared to a roll cast in one-handed fly fishing, although by using the fly as an anchor, a Spey cast allows a greater loading of the rod and thus achieves greater distance than a one-handed cast. The two most commonly used styles of Spey casting are the "Single Spey" and the "Double Spey". Mastering both the Single Spey cast and the Double Spey cast will be essential if the fly caster is to be able to cast from either bank of the river in whatever type of wind that may be present. The Single Spey cast may be considered better by some, as it cast the line further, and it can be used with winds blowing upstream. This Single Spey cast is part of the "Splash and Go" (or touch & Go/Kiss & Go) group of casts. 1. Feed however much line you want to cast into the river, letting it drift downstream (to your left). 2. Make sure you're facing downstream with the rod tip pointing down or the rod just off the water level. 3. Hold the lower grip of the rod with your hand that is on the downstream side (your left hand); the right hand is on the upper grip. 4. Lift the rod up at a steady pace so almost all of the line in the river is out of the water and being brought up towards you, and gently rotate your body to face more across the river & towards your target of the cast. 5. As you lift the line with the above move, this is followed by gently dropping the rod tip down in a small arc as you lift it upstream, and smoothly pull the rod up and upstream at the same time. 6. The end of the fly line, the nylon leader and the fly should come back upstream towards you, and you should aim for the fly and some of the leader to gently kiss the water about a rod length out in the river and a little upstream of your casting position; right before the fly kisses the water, raise the rod tip as if you were going to make a roll cast, and make a powerful forward stroke in the direction you are facing out across the river. 7. You should be able to achieve and angle change (the angle between the where the fly line ended up downstream before the next cast, and where you want to cast to [target]) of around 45 degrees with ease. 8. As you make the forward casting stroke, the upper hand (right hand in this case) will push the rod and tip forwards towards the target, and the aerialised loop of line (from the rod tip to the water) will then be re-energised in the new direction of the casting stroke. The fly line will then progress over the river, unfurling the energised loop (the D Loop) as it goes, and the line, leader and the fly should end up towards the other side of the river (target). The Double Spey cast may be considered easier to perform than the Single Spey, but only because this cast can be performed more slowly and deliberately, and corrections more easily made during elements of the cast. It is a sustained anchor cast in that some of the fly line stays in contact with the water at all times until the final forward casting stroke is made. This Double Spey cast is useful in downstream winds. 1. Start with the line and fly downstream (to your right). 2. Rotate the rod steadily into an upstream position, keeping your rod tip horizontal & low to the river surface and your right arm extended. 3. 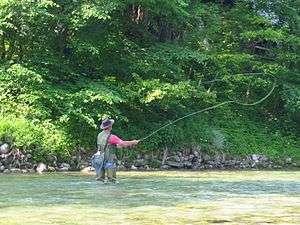 The line, leader and fly will come upstream towards you, and the fly and leader should end up about a rod length away from your position, downstream and out into the river some. The tip of the rod is upstream of your position. 4. The rod tip is then swung out and around horizontally and quickly downstream, resulting in the line upstream of your position being gradually lifted or ripped from the water downstream, but not moving the 'anchored' position of the fly and leader; as you move the rod out and around downstream, the line follows the rod tip, and you will continue this rotation of the rod and lift the rod tip gradually as the rod tip passes your right shoulder, and the line will then follow to create the D loop downstream and behind your position; 5. Just as the creation of the D loop behind and downstream of your position is about the lift the anchored line tip, leader & fly, begin the forward casting stroke to launch the line, leader & fly in the direction opposite (180 degrees around) the D loop, and in the direction of your target across the river. This technique was developed on the River Spey in Scotland. 1 2 Cook, Jack. "Spey Fly Fishing - Demystifying the Two Handed Rod". Retrieved 2009-05-19. ↑ Gawesworth, Simon (2004). Spey Casting. Mechanicsburg, PA: Stackpole. 1 2 Dean, Floyd. "Spey Casting". Retrieved 2009-05-19. ↑ Rosenbauer, Tom (2007). The Orvis Fly-fishing Guide. Guilford, Connecticut: Lyons. pp. 91–96. ↑ Falkus, Hugh (1994). Spey Casting: A New Technique. London: Excellent. pp. 99–105. Gawesworth, Simon (2004). Spey Casting. Stackpole Books. ISBN 0-8117-0104-2.